Next monthly Astronomy Meeting and Telescope Viewing Night Saturday, 2 March 2019. Further details under meetings tab above. 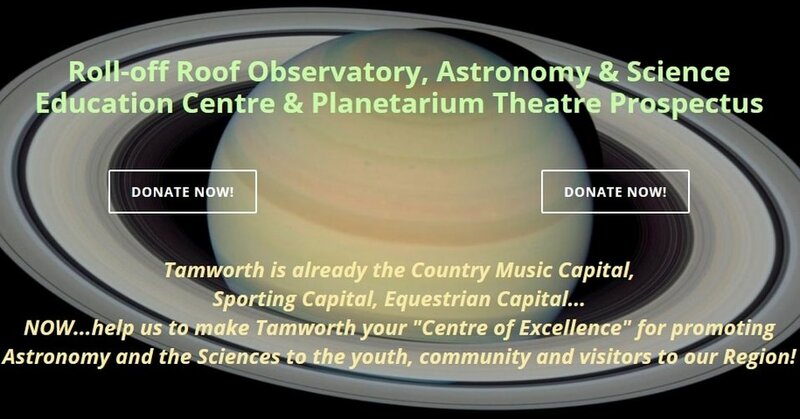 $1.8 million NSW Government grant approved for Tamworth's Astronomy & Science Education Centre & Planetarium! Read our media release here. Media coverage at: The Northern Daily Leader, Prime7 News, NBN News. Stay tuned for more updates! We're building a Roll-Off Roof Observatory, Astronomy & Science Education Centre & Planetarium Theatre to show YOU the wonders of the Universe through one of the largest privately owned telescopes in Australia - watch the following video, then click the image below to see how you can help!